Of companies that have a major loss of business data, 43% never reopen and 29% close within two years. As a result, preparation for continuation or recovery of systems needs to be taken very seriously. Norwich Telecoms can help save you time and money with the aim of ensuring minimal losses in regards to your telecoms should a disruptive event occur. Internet connectivity and phone lines are the life blood of all businesses. Outages or interruptions of any kinds can have a severe impact on your business and the productivity of staff. Care Levels – Our ADSL and Fibre to the Cabinet (FTTC) internet provisions can have optional enhanced care levels applied to them. These SLA’s provide reduced fault resolution times on outages and service degradation. 99.9 Uptime – Our Ethernet First Mile (EFM) and Leased Line internet provisions are all backed by 99.9% guaranteed uptime SLA’s. Redundancy – ADSL broadband lines can be provided and configured for fault tolerance. Care Levels – Our PSTN and ISDN provisions can have optional enhanced care levels applied to them. These SLA’s provide reduced fault resolution times on outages and service degradation. SIP Trunks – As internet connectivity speed and reliability increase, SIP trunks ae becoming more popular. SIP trunks utilise your internet connection for voice calls. For our EFM and Leased Line customers the underlying data connection is covered by a 9.99% uptime guarantee. Regardless of the internet connection utilised for SIP, we are able to put in place call routing should any service outages occur. Incoming calls are then automatically routed to an alternative location or even to mobiles. Maintenance – Norwich Telecoms can tailor your maintenance contact to include full replacement systems. In the event of a disaster we can have you up and running with a new phone system almost immediately. Hosted Systems – As most of the hardware is located at the hosting providers location, in the event of a disaster the effect of telephone system hardware is minimal i.e. handsets. Handsets can be replaced easily and workers can work transparently from most locations with a stable internet connection. Staff can operate from home or temporary locations and appear as though in the office – calls can be answered and transferred as normal. Downtime – Internet and telecoms downtime can be minimised or even eliminated with an efficient plan in place. Prevent financial losses – Damage is minimised as business continues to take place.The inability to be able to generate sales or receive orders, even if it’s just for 24 hours can be catastrophic. Maintain reputution – A telecoms and data network recovery plan (as part of an effective disaster recovery programme) can prevent loss of credibility and goodwill with customers and suppliers. 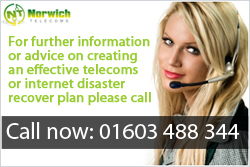 Response – Locally based support and advice from Norwich Telecoms is only a phone call away.